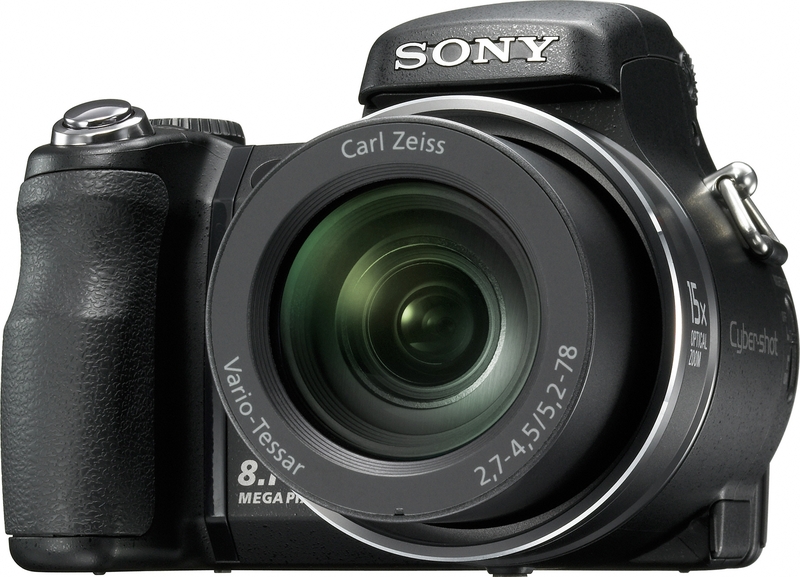 My Camera is a Sony DSC H9. I must say with 15x zoom it is among the better non-SLR cameras for Bird Photography. MPEG Movie Mode: MPEG VX Fine with Audio (640x480 at 30fps) (MPEG VX Fine requires Memory Stick DUO PRO™ media), MPEG VX Standard with Audio (640x480 at 16fps), Presentation Mode (320x240 at 8.3fps). Supplied Accessories: NP-BG1 rechargeable battery, BC-CSG battery charger, Flower Lens Hood, Lens cap with strap, Lens Adaptor Ring, A/V and USB multi-connector cables, Shoulder strap, Remote Commander, Software CD-ROM Note: No Memory Stick® DUO media or adaptors are included. Weight: 1 lb 3.3 oz (546 g) including NP-BG1 battery pack, shoulder strap, adaptor ring, lens hood and lens cap, etc. The above specs might read as awesome, but in reality the DSC H9 disappoints on many fronts. Firstly, the cameras greatest criticism is its aggresive nise reduction which causes great loss of detail and sharpness. At 8 mega pixel setting I find that there is too much compression of the image and thus prefer the 5mp setting. This means that I have far less pixels in my photos and thus image cropping is limited. As an alternative, I considered purchasing a teleconverter lens, so that I could get close enough to the birdies without actually having to crop images. Besides, quite often, a 15x zoom is just not enough for framing distant birds. 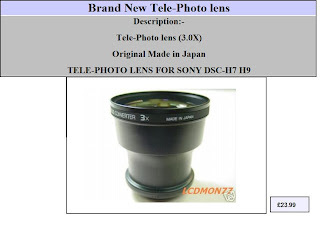 Now, Sony makes an excellent 1.7x TC lens (VCL-DH1774), but at over a 100 GBP, its far beyond my reach at the moment. And thus while Iwas oggling at the sour grapes, I came across this on Ebay for only 23.00 GBP. I was instantly hooked. 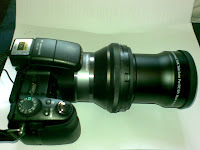 A 3x teleconverter! Almost double the magnification for about 1/5th the price! They say that in lenses, you only get what you pay for and how right they were to be. With just 23 pounds to lose I took the gamble and ordered it. It took almost a month for the item to reach from Hong Kong, but it finally did arrive and I was overjoyed. The lens turned out to be a generic make, which ships with a 74-58 mm step down adapter ring. This adapter enables one to screw it onto the 74mm adapter that comes with the camera. I wasted no time in testing it out and I must say I was heart broken. The magnification was great, but the images suffered from massive amounts of purple fringing. Although, one can remove purple fringing from photos through image editing software, such as photoshop, it is laborious and not feasible to work with tens or hundreds of photos that one can accumulate in a day. Furthermore the results are often not very satisfactory. I did a little bit of research and found that the reasons for the purple fringing could either be the lens itself or the camera or both. "You'll find a slew of bargain-basement high-power tele-converters on eBay, and each costs less than the other. But each produces more distorted images with more chromatic aberration. Low-end conversion lenses are no bargain unless you don't care if your images look like a kaleidoscope with heavy purple highlights. That's not an exaggeration. They really can be that bad." ...almost as if they were talking to me! and again..... "2X adapters and 3X adapters get you into a range that no digicam can support. A good quality 1000+ mm lens costs many thousands of dollars. You're not going to duplicate that quality in a $100 US add-on lens, no matter what the manufacturer claims. In my tests, 1.7X seems to be the maximum effective telephoto adapter you can use on an H-Series camera without running into image quality problems." little wonder then that the manufacturers themselves dont make bigger TC lenses. "It's a minor miracle that the H-Series lenses produce crisp, undistorted images at 432-465 mm. You're tempting fate when you add on a lens whose quality and capability are not up to the standard of the Carl Zeiss-engineered lenses on the H-Series cameras." So there you go! I wish I had read this before buying the lens! The lens could just be amplifying this effect. I wonder about the images that would be produced if I added the lens onto some other make of camera. I may have to wait a few months for a test on my brothers Canon S3IS. I tried one option to try and reduce the purple fringing - adding a uv filter. However this seems to have no effect and I`m left wondering if i purchased a normal piece of glass claiming to be a UV filter! I have mostly given up on the lens now, as my attention has now been diverted to a much better way of getting awesome bird photos- the art of Digiscoping. More on that in another post.